Local TV and newspapers frequently report on DUIs in Los Angeles or other incidents where motorists smash into homes, restaurants or other buildings. It’s usually an accidental encounter. But when Cheri Tenney ran her vehicle into her home, it appeared to be very deliberate. Tenney, who lives in Seminole, Florida, may have been doing a little too much celebrating of the Fourth of July holiday before she arrived home in the early evening. 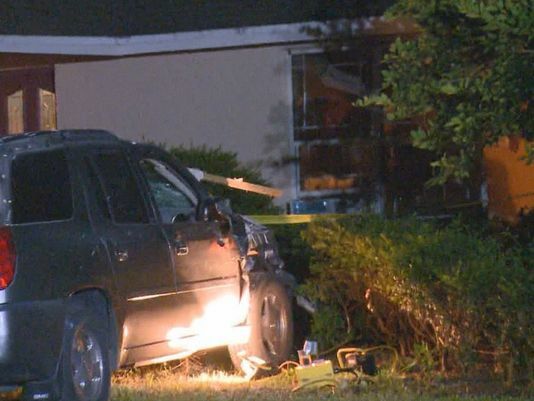 Her first attempt to drive her 2005 GMC Envoy into her garage didn’t end well. She hit the wall and then tried to back out. When Tenney wasn’t successful with that maneuver, she gave up and went into her home. But she didn’t remain there long. According to police reports, Tenney got into her car again around 10 p.m. (clearing the garage this time) and then sat in her driveway revving the engine. Then she simply put the Envoy in gear and rammed it through her front window, coming out the back window. Most people would have had enough at this point. Not Tenney. She put the car in reverse and slammed through the home again, this time moving from back window to front window. She brought the vehicle to a stop on the front lawn and left it parked there when she returned to the house. By this time worried neighbors had alerted police. The police report doesn’t give any details on what happened once the officers entered the home, except to say that Tenney was only half dressed. She must have assaulted one of the cops, however, because they charged her with battery on a police officer as well as DUI once they got her to the police station. Talk about creating your own fireworks for the Fourth!